A friend of mine told me not to be a Luddite some years ago. I always considered myself fairly up-to-date on new technologies. When my friend gave me that advice, I was sitting out the then current revolution happening in professional and consumer photography – the digital photography. This was “way back” in 2004 and nearly everyone I came across had jumped from film to digital. I was reluctant not because the quality had finally reached a point where it was very good. I was reluctant to give up a medium I loved, and that was film. I’ve since gone through a variety of simple point-and-shoot and digital SLR cameras since then, and I’ve fallen in love with the ease of digital photography. I suppose my only fear now is the ability to open my digital files 25 years from now, but that’s another subject. I mention my own foray into digital because of my own fears, if you will, of digital cinematography and more importantly, digital projection, used in the movie industry. For nearly ten years now, the film industry has been plugging away at exhibitors to enter into digital projection. For the studios, it’s a no-brainer. They save lots of money on prints and distribution. For exhibitors, it’s really more about marketing than making money. Digital projection, according to its proponents, is supposed to revolutionize how we see movies. In reality, we’re seeing glorified HDTV. The pictures are bright and clear with no shaky jitter. Dust and scratches are a thing of the past. Fine. But a good projectionist who handles a film print properly and who maintains the projection equipment can have a presentation that surpasses digital projection. houses or fine movie presentations anymore, because there are. But for the most part, it isn’t the same. Not much, to be honest, gets me to go to a movie theater these days. I think the presentation is more subpar than it used to be in the dreaded local movie theaters of my youth. I don’t like the idea of spending a lot of money at a theater when I have to sit through commercials. And my local theaters have embraced digital projection, which to my eyes, is cold and fatiguing. I yearn for better presentation for my money. I yearn for something that resembles film running through a projector, not something that resembles my HDTV at home. I guess I’m a Luddite in regard to movies today. Yet, maybe there’s hope. I’ve seen the future of movie presentation, and by my own admission, it shattered what I’ve thought about digital projection. In 2002, I had the pleasure of meeting an inventive gentleman named Robert C. Weisgerber. Born and raised in New York, Weisgerber still had the accent of a guy who was familiar with Times Square and Fifth Avenue. He was classy and knew a heck of a lot about the roadshow movies of the 1950s and 1960 I love. I had just seen his demonstration of a spectacular new film presentation, Super Dimension-70. He wanted to bring back the thrill of seeing movies again on the big screen. His passion showed in the images he presented that day at the Harmony Gold Theatre on Sunset Blvd. The 70mm images from his short film, narrated by Walter Cronkite, were crystal clear and breathtaking. Robert and his producing partner, Barrie O’Brien, became friends of mine. When SDS-70 was introduced to both film industry professionals and the media back then, companies pushing digital cinema were making inroads in motion picture exhibition. Their argument was that film was a dying medium and doomed for the dinosaur pit. Digital was the way to go and those backing d-cinema claimed it was superior to film presentation. Film purists knew that was stretching the truth quite a bit. What impressed me about Robert’s system was that it could be placed in any current theatre without adding tremendous expense to the operator or studio. Audiences would get a bang for an extra buck or two. I haven’t heard any consumer rave about going to see a movie in digital projection. I’ve heard them rave about 70mm. And I’ve heard them rave about IMAX. Many who saw Robert’s SDS-70 presentation fell back on the myth of 70mm being super expensive and cumbersome. You’d think that directors, studio executives and studio accountants who complained about 70mm had to load the reels themselves onto projectors! But those who saw SDS-70 were totally impressed with it. Oddly, those same studios who complained about the expense of 70mm prints have invested even more money in IMAX and IMAX 3-D prints. Those prints are much more expensive and cumbersome than any 70mm format. 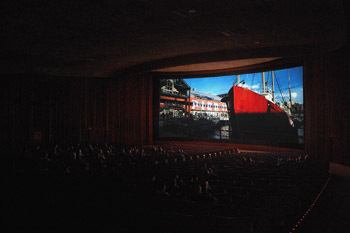 In addition, many exhibitors have been installing digital projection systems in many of their theaters. So much for saving money! SDS-70, in my opinion, was a burst of energy movies needed. It was spectacular to see and it didn’t cost an exhibitor or studio too much to use. Seemed like a smart idea to me, especially considering how much studios try to save money. Instead, they invested in digital projection, digital 3-D, IMAX prints, IMAX 3-D prints, 35mm prints and claimed that the movie exhibition industry was dragging its feet over the roll out of digital projection. Yet here was a cost effective and box office drawing projection system that would knock people’s socks off. For a generation of movie goers who liked everything they experience to be amped up past 11, SDS-70 was perfect. Instead, the movie industry and exhibition industries took their own very expensive route into the billion dollar or so rollout of digital projection. Weisgerber went back to the lab. In late 2007, Weisgerber invited me and other members of the film industry and press to the famed National Theatre in Westwood, CA. The National was in its last days as a movie house, only to be replaced by a retail store. This was a famous and once very popular theater where many of Steven Spielberg’s movies were presented on its big screen. It was also the venue in which Douglas Trumbull unveiled his own super projection system, Showscan. Weisgerber was there on that balmy night to present his new DMX projection format, which is a digital version of his vaunted SDS-70 system. Would DMX, a 2K digital projection format, rival his 70mm system? And would it blow away standard d-cinema as we presently know it? There was a considerable crowd there that night. Considering that wildfires had blanketed the Southern California sky with ash, it was a good showing. Weisgerber asked his projectionist to run the original SDS-70 short. As I raved back in 2002, this a stunning example of how good 70mm can look, especially at 48 frames-per-second (standard film runs at 24 frames-per-second). The effect of watching this hyper-sharp and bright film is miraculous. Watching this short film again, this time on the National’s famous 60-foot screen, was nothing short of stunning. This, to me, is what watching spectacular movies is all about. Weisgerber asked his projectionist to run the digital version of SDS-70 in his new DMX format. To say that I was stunned with the quality is an understatement. How in the world did Weisgerber get digital projection to look this good, and how did he manage to maintain most of the high quality of his 70mm system? This couldn’t be right. No way could digital projection look as good as 70mm, especially his SDS-70 system. What I saw in DMX was a presentation that maintained the quality and look of 70mm, but in an efficient mode of delivery. Weisgerber then rolled out some samples of DMX that caused the audience that night to say, “Wow!” He compared a 35mm version of SDS-70 with DMX. He then showed a new 35mm-to-DMX test and it was almost as sharp and clear as his 70mm footage. I won’t blow the surprise in how that footage was actually filmed, but it was a test to show how 35mm could look in DMX. This footage, as an example, simply looked spectacular. It looked nearly as good as a film shot in 65mm. It far surpassed any digital presentation of a 35mm originated film I’ve seen in the last few years. It felt natural and there was no eye fatigue. The imagery was sharp, bright and had depth to it without the need for stupid 3-D glasses. Has James Cameron or Jeffrey Katzenberg seen this technology? The biggest surprise came when a few clips from “The Searchers” (1956) were shown. The audience confessed that they had never seen the movie look that good. DMX maintained most of the quality of the film’s old film stock, while giving it a sharp and fresh look that wasn’t unnatural. The only parts that looked a little unnatural were some motion scenes where the 48 frames-per-second rate made the film motion a bit too defined, but they were minor. What Weisgerber said after the clips were shown shocked the audience. They were watching these clips from a DVD transferred to DMX. Warner Bros. didn’t have a high definition version available at the time. I could just imagine how good a catalog movie, which was shot in VistaVision, would look in DMX or SDS-70. I walked out of the National with a smile on my face. I was no longer a Luddite when it came to digital cinema. Weisgerber had done it right. In late summer 2008, I was invited to see a new demo of DMX at the classic Egyptian Theatre in Hollywood. This theatre was nicely restored by the American Cinematheque in the late-90s and has shown a number of films since then. The screen is almost 60-feet wide and one of the projectionists, Paul Rayton, is considered one of the best in the business. Since the National no longer exists, Weisgerber and O’Brien set up shop here. Weisgerber showed the same clips as he did in 2007, but added some new ones from Disney. Clips from some of Disney’s special venue films and a preview from “Pirates of the Caribbean: At World’s End” were shown. Let me just say that I’ve never seen the “Pirates” movies look this good. I was seeing sharpness and clarity that I haven’t seen in most movies today. The daytime shots of “At World’s End” looked exceptionally clear and bright. What really surprised me were the shots of night and rain. There is a sequence in “At World’s End” in which Jack Sparrow (Johnny Depp) and Davy Jones (Bill Nighy) swordfight on a ship’s mast. DMX pulled out all the elaborate detail in this sequence, including the so-called flaws in the visual effects. This demonstration really showed how good DMX is. The next demonstration showed clips from a couple of Disney’s special venue films. These are films that are shown exclusively in some of Disney’s theme parks. They’re usually shot in 65mm film, then shown on large screens at the various parks in 70mm or 70mm 3-D. One of the clips was from “Muppet-Vision 3-D,” a staple at Disney’s Hollywood Studios and Disney’s California Adventure for some time now. The film in 70mm 3-D has always looked soft to my eyes. 3-D, in general, just doesn’t look natural to me. However, DMX 2-D version really brought out the clarity and color of the Muppet film to life. There’s a character made from early CGI animation who pops in and out of the scene. I’ve never seen him look this clear, and his early CGI flaws really show. This isn’t a comment on the original filmmaker’s ability to bring this character to life with the technology at hand. It’s just to show how good DMX is at bringing out details. The next clip used a few scenes from Disney’s “Mickey’s PhilharMagic” attraction in Florida. This film uses many of Disney’s characters with computer animation in 3-D. The clips showed Donald Duck getting into trouble, and clips of Ariel singing (there was no sound on these clips). These were shown in 2-D DMX. All I can say is, “Wow!” The films looked outstanding. Of course, these clips may have been taken directly from the digital master files, but they still looked like 70mm film. DMX is an off-shoot of Weisgerber’s Super Dimension-70 (SDS-70) film projection system. In that 70mm version, film is preferably shot on 65mm film at 48 frames-per-second, then screened in 70mm on SDS-70 projectors at the same frame rate. The result is a hyper-realistic, yet natural looking film presentation. Scenes with action or fast movement are intensified with the higher frame rate. Yet there are subtle scenes that can easily lend themselves to drama that work equally as well in SDS-70. DMX takes that same approach for higher quality presentation into the digital age, and in my opinion, does it well. The system uses Texas Instruments’ DLP technology (a technology that has been around since the 1970s, by the way) at 2K resolution. With a few proprietary software upgrades, DMX turns standard DLP projection into something spectacular. The result is a film-like presentation that actually feels like you’re watching film in 70mm. I didn’t think it was possible for digital to look this good, but here it is. With all the talk of 4K projection and 3-D, DMX trumps those formats. IMAX is unveiling its own digital format for smaller screens in some markets. I haven’t seen it to remark about the quality. It should be very good. But in basing my own impressions about SDS-70 versus IMAX film presentation, SDS-70 is far superior. I would imagine, based on what I’ve seen in DMX, that it will be a better presentation. DMX requires no major theater upgrades as an IMAX or digital system would. It uses its technology through existing digital projection systems. There is no need to modify an auditorium or replace the current screen. The additional beauty of this format is that it’s more than capable of filling a large 60-foot screen with no problem. Both SDS-70 and DMX utilize the natural aspect ratios that films were shot in, without letterboxing as IMAX does with its DMR prints. There have been many theaters built in the last few years that have a large 50-foot or more screen. There are two issues with those large screens. 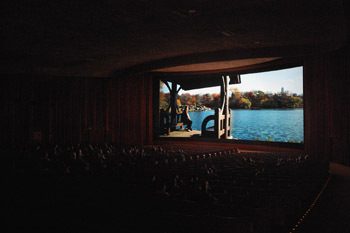 One, many theaters have built the screens so that the masking comes down to create a widescreen effect. This goes completely against the logic of shooting in widescreen. 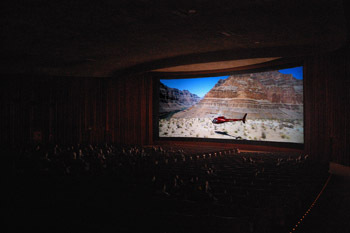 Widescreen movies are meant to be larger and wider when projected. Two, many of these screens are so large that a standard 35mm print or digital presentation looks faint. The image quality is usually mediocre. DMX solves this by not only putting a super sharp image on-screen, but it pumps out enough light to fill the screen evenly. The result is a very pleasing picture. I applaud that IMAX has sold commercial exhibitors on using IMAX Digitally Re-mastered (DMR) prints. At least IMAX screens aren’t filled with “enhanced 35mm prints” that don’t belong on an IMAX screen in the first place. Audiences are getting 70mm prints that were essentially considered dead by the mid-1990s. Early in this decade, many theaters that had an expensive IMAX screen would show 35mm prints to fill those seats at night. IMAX finally got into the game and started producing the IMAX DMR prints to maintain their market. The results have been successful, though we’re really seeing either digital or 35mm originated film usually letterboxed for the IMAX screen. The results have been mixed. Some prints look absolutely great, while others (mainly shot in the Super 35 format) look okay in comparison. Since the initial unveiling of DLP with “Star Wars: Episode I – The Phantom Menace” in 1999, digital systems have come and gone. DLP is already on its second incarnation with 2K projection as opposed to 1.3K projection. Boeing tried a satellite system that was supposed to beam movies around the world to theaters. That didn’t last long. JVC had D-ILA for theaters, but didn’t go far. Kodak had a prototype system some years ago that didn’t go far, either. Sony’s been struggling to get its projection system on the market. The technology has changed so much that it’s questionable if today’s digital projection won’t be out-of-date in the next ten years. I’m not suggesting that technology doesn’t move forward. I believe that it must, but it should be under the best conditions of having a technology that won’t be obsolete in five or ten years. The new technology should surpass, not equal, a high quality 35mm film print. What the studios and some exhibitors are doing is basically throwing out something that has worked for a century for new technology that may not be compatible with tomorrow’s technology. Think about it. I’m sure that many people spent a fortune on early HDTVs, only for the technology to become vastly superior in little time. The new HDTVs have much thinner screens, as well. I’m sure that many large rear-projection HDTVs are filling up dumps. Dolby Laboratories and Digital Theater Systems (DTS) released Dolby Digital and DTS Sound in the early 1990s, proclaiming that their sound quality was identical to the original sound mix. Not quite, and those formats killed better quality analog movie sound in the process. Now both companies have introduced much higher quality “bit-for-bit” soundtracks for Blu-ray disc in Dolby TrueHD and DTS-MA (Master Audio). Who knows if these formats will make into the movie theaters, but I’d imagine that they’d be good for movie exhibition. My point is that the companies and individuals behind digital cinema and digital 3-D aren’t looking at the whole picture. They’re looking, as many business owners do, at the bottom line. They’re also settling for the easy route, rather than trying to do something with high quality. I believe that high quality and going the easy route can work for the studios and exhibitors. The studios for years have tried to come up with cheaper (and usually lower quality) costs to off-set their expenses. First it was the rollout of digital sound in the 1990s, which essentially killed off widespread use of 70mm prints. Theater chains like to cut corners as much as possible, too. Either way, the consumer who goes to a movie theater today spends much more than he/she did not too long ago. And in reality, outside of stadium seating, a consumer doesn’t get an improved picture and/or sound presentation that would have with a 70mm print. The consumer is hit with a barrage of commercials, digital slides of local doctor’s offices, and today’s latest hit song. Consumers who watch digital projection are basically watching glorified HDTV and getting charged a lot of money for it. I love film presentation when it’s done correctly. I’ve seen both 35mm and 70mm prints that are gorgeous. The way film flickers through the projector casting a big, bright image on the screen is what makes going to the movies special. Digital projection, to me, is cold. It reminds me of how the compact disc first wowed many people with its crystal clear sound, free of so-called imperfections of the analog LP. Isn’t it amazing how some people are now embracing that “old” LP in favor of CDs and better yet, MP3 recordings? Some studios are pushing for digital 3-D cinema. They claim that audiences are clamoring for the format, and that movies will certainly benefit. They also claim that 3-D has been very successful at the box office. Truthfully, I’ve heard of no one raving about seeing a current movie in 3-D (except for my daughter). The 3-D is still not refined enough to where it is visually natural. I still get headaches after watching digital 3-D, and I think the process mutes the color scheme of movies and deadens the image quality. Studios and their PR departments will tout how much money 3-D movies make. But that’s misleading. When I took my daughter and two of her friends to see “Hannah Montana: Best of Both Worlds” in 3-D, I nearly passed out when the girl at the box office told me how much it cost. It was almost $60 for a matinee on a kid’s movie. Studios and exhibitors will charge an extra $2 or more for a digital 3-D movie. That’s why the movies are making more than they normally would in 2-D. If “Meet the Robinsons” was in 2-D, I don’t think it would’ve made half the money it did in 3-D, just as an example. The “Hannah Montana” movie probably would’ve done just as well in 2-D simply on the fact that Miley Cyrus is popular now. I don’t believe that digital 3-D, which really isn’t that much better than traditional 3-D, is the answer to bring audiences into a theater. I think it’s a novelty and doesn’t add anything special to seeing a movie. Some die hard fans love the format, and that’s great. Me, I much prefer the natural appearance of DMX. I love DMX because it does film presentation right. It looks stunning on a big screen, it’s cost effective, it blows away almost any theater presentation today, and it’s compatible with digital systems that are currently installed in movie theaters. If there is a digital cinema presentation that could save studios money and increase exhibitor revenue with a few inexpensive upgrades, DMX is it. This is a format that I don’t mind paying an extra $2 on my movie ticket, because I’m getting my money’s worth. The picture quality of DMX is exceptional. It’s almost like looking through a crystal clear window. Rather than putting on silly 3-D glasses that I believe cause needless headaches and diffuse the color and sharpness of the original images, DMX offers dimensional quality (depending on the film’s content) that far surpasses 3-D. You use your own two eyes and there’s no need for 3-D glasses that pollute the environment anyway. DMX is free of flicker and the “rainbow effect” that is associated with some digital projection. The format also allows for uncompressed digital sound, which makes a huge difference in sound quality. I don’t own stock or any piece of Super Vista Corp. (the owner and inventor of SDS-70 and DMX), nor am I employed by them. I’m not an employee of the company. I am friends with both Robert Weisgerber and Barrie O’Brien and I do think they’re wonderful people. But I admire what Weisgerber and O’Brien have done with both SDS-70 and DMX. Weisgerber really believes in giving a movie audience a bang for its buck. What he has done with DMX is built a far better engine than anybody else has. It’s clearly superior and clearly smart in the way it’s executed. For all the cries of print costs, the digital cinema conversion and what have you, DMX is the answer people have been looking for. It’s cost effective for both the studio and exhibitor. It offers a truly excellent film experience that you can’t get at home, in IMAX or digital 3-D.
I’ve seen a lot of innovation over the years in regard to digital cinema. The first tests I saw in 1999 with digital cinematography were okay, but nothing special. Digital projection looks okay, and it has gotten better. But it’s merely acceptable. I’ve seen various test films direct from the negative on IMAX films. I’ve seen what a Viper motion picture camera can do. I’ve seen surprisingly good high definition video to 70mm prints. I’ve seen comparisons between 35mm, 70mm and digital projection on the same day. By far, 70mm presentation (especially if the film was shot in 65mm) is still the best way to see movies. I think that DMX nearly replicates that perception of seeing 70mm film on a big widescreen. It’s really that good. Super Dimension-70 is even better, but as the world goes more digital, I think that DMX is a great format. People will still go to the movies. Economic crashes, wars, television, the Internet, home theater and other pastimes haven’t killed off going to the movies. I think what has been lost over the years is a sense of showmanship and quality in movie presentation. DMX brings that thrill of seeing movies back to the big screen. There has to be something that is superior to 35mm or digital projection to ramp up the box office and make going to the movies exciting again. For digital cinema to survive and make sense, it’s got to have something better than what consumers get at home. That’s why I think DMX is the answer. Photos: © Bill Kallay. All rights reserved. Images of “SDS-70″ & “DMX” © Super Vista Corporation. All rights reserved. This entry was posted in Press Room on April 2, 2013 by Administrator.